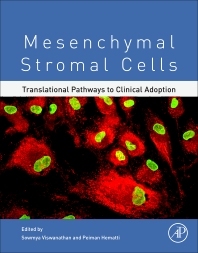 Mesenchymal Stromal Cells: Translational Pathways to Clinical Adoption provides the latest information on the necessary steps for successful production of stem cells for a clinical trial. Written by professionals with hands-on experience in bringing MSC therapies to the clinic, and building on the biology and mechanisms of action, this unique book covers the development and production of clinical-grade products that are suitable for use in humans. From design of a cell production facility, to obtaining regulatory approval and reimbursement issues, it is a useful guide for researchers and administrators across biomedical research. Dr. Peiman Hematti joined the Section of Hematology/Bone Marrow Transplantation at the University of Wisconsin-Madison in July 2004 as an Assistant Professor in the Department of Medicine. Dr. Hematti has completed a combined Internal Medicine/Pediatrics residency at the Cleveland Clinic Foundation and then Hematology fellowship at the National Heart, Lung and Blood Institute at the National Institutes of Health. His clinical interests are in inpatient care of hematopoietic stem cell transplant patients. He is the director of the clinical hematopoietic cell processing laboratory, and in that capacity oversees all the peripheral blood stem cell collections from the patients and processing of their products. Dr. Viswanathan has 10 years of experience leading multi-disciplinary teams of translational researchers, clinicians, nurses, manufacturing technicians, quality assurance manager, IT programmers and project managers who translate cell-based research into clinical trials. She specializes in commercial product development of biologics with specific expertise in stem cell translational research, preclinical pharmacology, GMP-compliant cell manufacturing of cell-based products, and working with regulatory agencies. She is currently Associate Director of the Cell Therapy Program at University Health Network in Toronto where she oversees the scientific, strategic, operational, regulatory, quality, pre-clinical strategy for the development of clinical-grade cells. In addition, Dr. Viswanathan works with the Center for Commercialization of Regenerative Medicine (CCRM), leading a vision for a Canada-wide national clinical program network, CellCan, that will concentrate on harmonizing practices, sharing strategies for clinical manufacturing of stem cells in Canada.